The church of All Saints in Milton Ernest is situated to the south east of the village to the east of the main A6 running through the village. 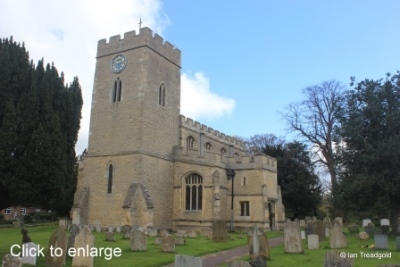 There is limited parking either in Church Green or in a parking layby on the Thurleigh Road near the church. 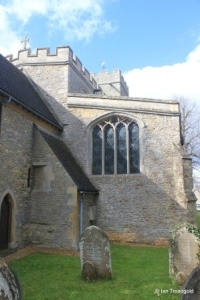 The church consists of a nave, chancel, north and south aisles with a west tower and a south porch with parvise above. The chancel is around 26 feet long by just 11 feet wide, with the nave adding 45 feet by 16. The north aisle is the wider at 15 feet whilst the south adds around 10 feet. The tower is around 12 feet by 11 feet and around 75 feet tall. 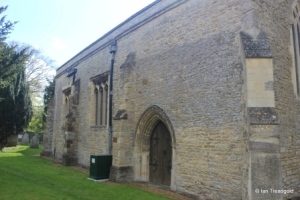 The oldest part of the church, the western end of the chancel dates from early C12 whilst the west tower was added in C13. 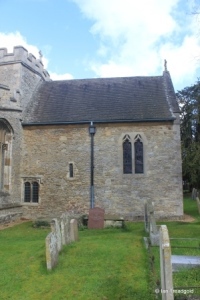 The eastern extension of the chancel dates from the early C14 along with the original south aisle and later in C14 the north aisle. 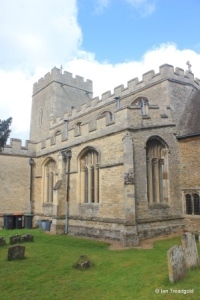 The south aisle was rebuilt when the porch, parvise and clerestory were added in C15. The south aisle has an east window, two windows to the east of the porch and a west window. 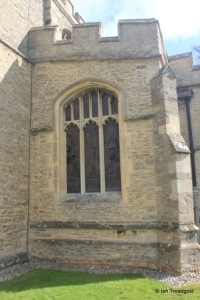 The east window is of three cinquefoiled lights with perpendicular tracery above over a transom, all under a four centred arch. 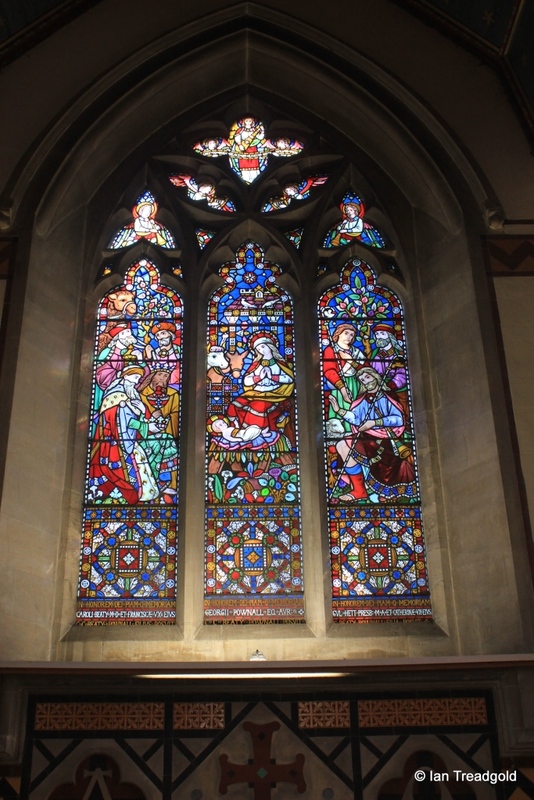 The two south facing windows in the south aisle are similar to the east window, much restored and are joined by a string course linking the hood moulds of the windows. 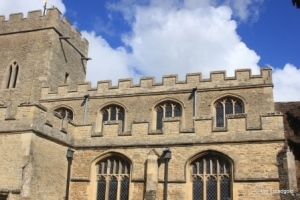 The south porch and parvise are, like the nave, aisles and tower embattled. 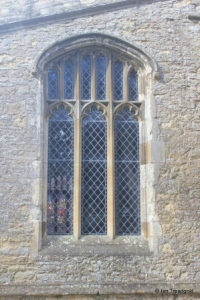 The porch has a square headed window to the west with signs of a similar window on the east. The wide porch entrance is under a square head with the same string course above and on the west side of the porch but not the east. There are flower motifs in the spandrels above the porch entrance. 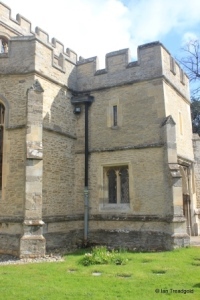 The parvise above has simple square headed single light openings to the south and west. The floor to the parvise has gone and access was probably by means of wooden stairs also now gone. 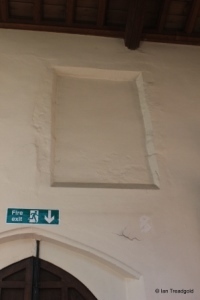 There is a blocked opening from the parvise into the south aisle presumably to a gallery over the south doorway. The clerestory above the nave has four three-light cinquefoiled windows under four centred arches on each side. 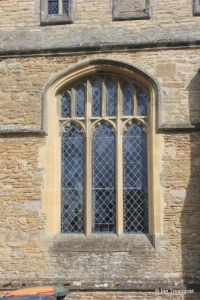 These windows are similar to those on the south aisle but without the perpendicular tracery. 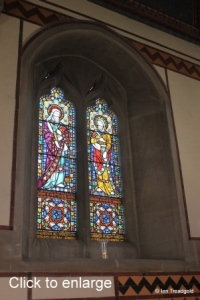 The west window of the south aisle is of the same style as the other south aisle windows. 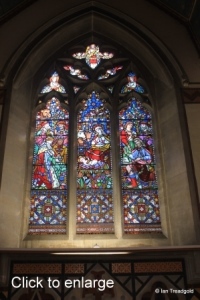 The glass in the window depicts Christ the Shepherd and is in memory of Lucy Starey who died in 1866 aged just 22 years. The Starey family owned Milton Ernest Hall from 1853 to 1872. 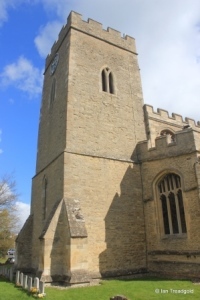 The tower dates from C13 and is of two stages with a single lancet to the west of the lower stage. 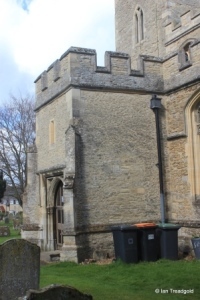 The tower also has low angle buttresses to the western corners. 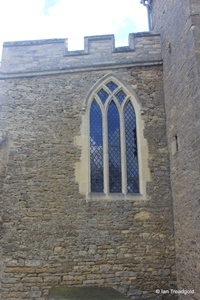 There is an external square stair turret in the north-eastern corner of the tower leading to the belfry floor. The belfry lights are pairs of conjoined lancets under pointed arches to the south and west. 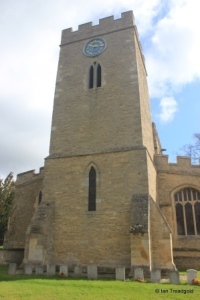 There is a clock face unusually high on the tower to the west. Normally a clock face would be below the belfry lights. The clock dates from 1882. The north aisle has windows to both west and east, a north door and two windows on the north side. 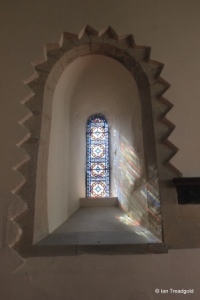 The restored west window of the north aisle is quite high in the wall and of three lights with intersecting mullions under a pointed arch. 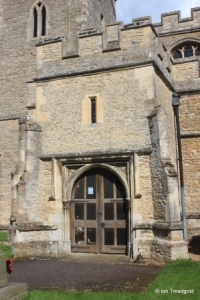 The north doorway dates from the middle of C14. 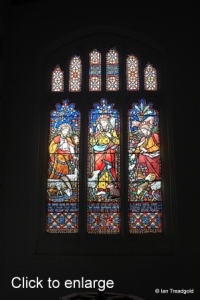 The two north facing windows in the north aisle are the same in style being of three ogee trefoiled lights under square heads. 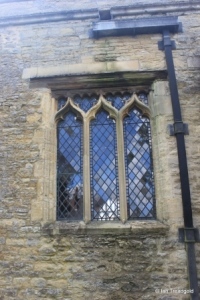 The head of the windows is interesting in that the upper part of the tracery is itself cusped under an oak bresummer or load bearing beam. 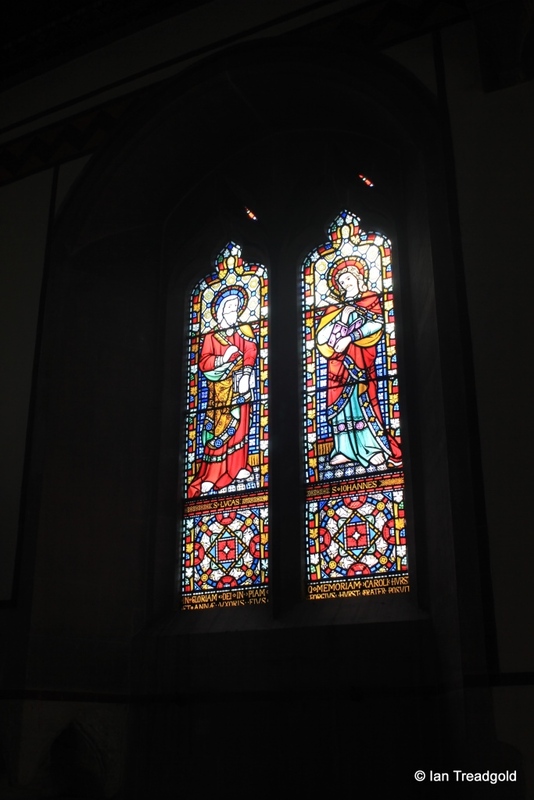 The east window of the north aisle is, like the window at the west end of the aisle, quite high in the wall. 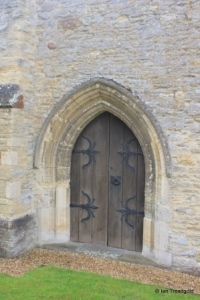 It is of four cinquefoiled lights under a low four-centred arch. 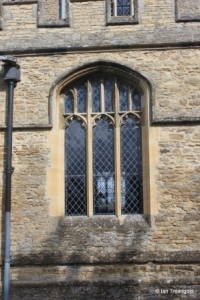 The small vestry on the north side of the chancel is obviously tailored to fit under this window. 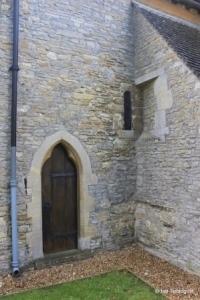 On the north side of the chancel, hard up against the small vestry is a small round headed light dating from the early C12. In keeping with the constraints of a window this size the internal surround is wide to admit as much light as possible. The window is now in a modern zig-zag plaster edging. 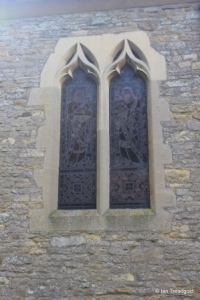 At the eastern end of the north side of the chancel is a modern window of two conjoined lancets with ogee heads. 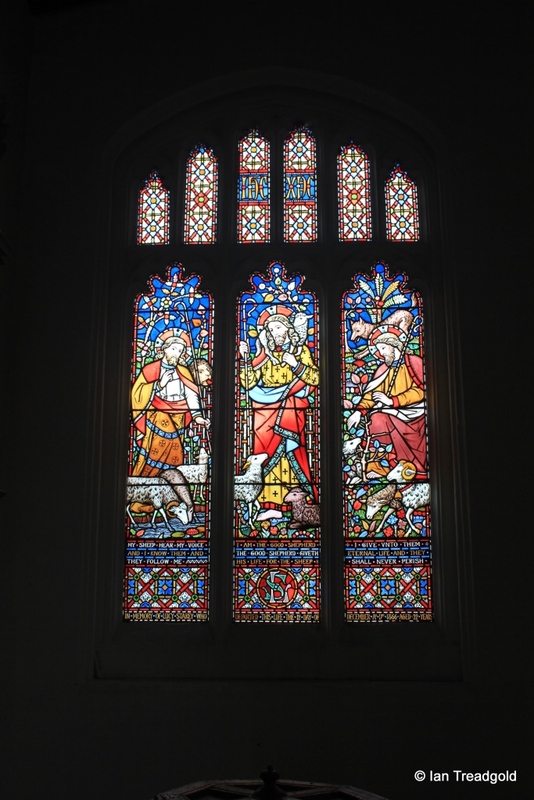 The glass depicts St Mathew and St Mark. 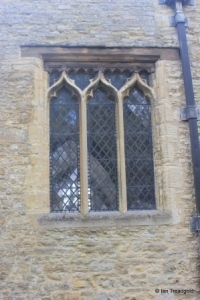 The east end of the chancel was added to the church in early C14. 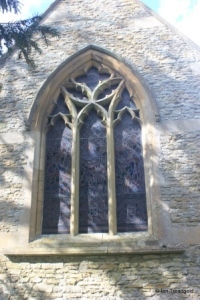 The east window is of three lights, the outer pair being trefoiled and the centre cinquefoiled with leaf-stemmed tracery above under a two-centred arch. The glass depicts scenes from the nativity. 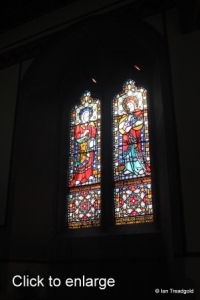 The south side of the chancel has a window to the east to match that on the north side with the glass depicting St Lucas and St John (Johannes). 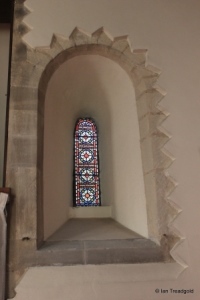 The join between the earlier western part of the chancel and the later eastern is clearly visible. 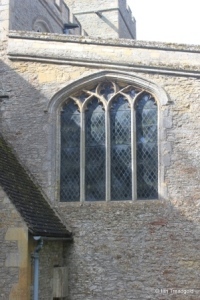 The western part of the south side of the chancel has two windows, a small round headed light matching that on the north and, to the west, a low two light window under a square head. 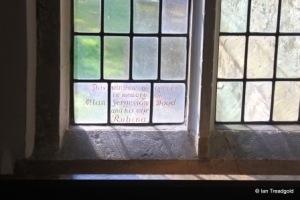 The glass in this window is in memory of Allan Fergusson Wood and his wife Rubina. 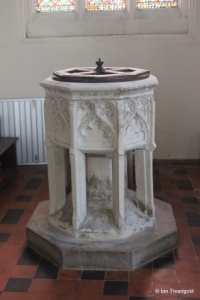 Inside the church, the octagonal font at the west end of the south aisle is made of clunch or soft limestone with angle buttresses clear of the centre stem. 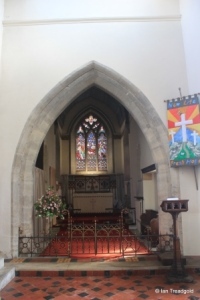 The chancel arch shows how narrow the chancel is in relation to the nave. The east end of the north aisle is screened off to form part of the vestry. 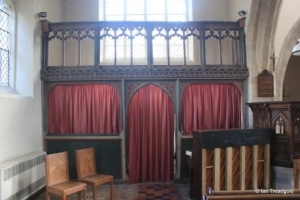 The screen is the original rood screen dating from C15. 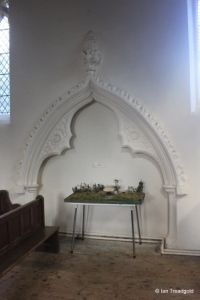 In the north aisle, there is an ogee-headed crocketed tomb recess dating from around 1340. 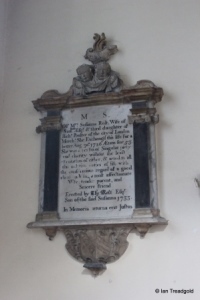 Towards the western end of the north aisle is a monument to Susanna Rolt who died in 1726. The Rolt family founded a charity to provide benefit to the poor of the parish. The charity still exists to this day now merged under the name of Turnor’s Almshouses. Christopher Turnor died in 1675 and also has a monument in the church. 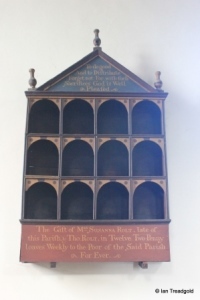 In Susanna Rolt’s name a weekly donation of 12 loaves of bread was made to the needy in the parish and the shelving for these loaves is on the north wall of the aisle.